“Muslim women are oppressed by their husbands”. In fact, so many have taken it upon themselves to campaign for the reforming of Islam to ensure such oppression no longer continues. And in all honesty, such statements couldn’t be further from the truth. While yes, some Muslim women, like all other women, may face injustice in their homes. It has little to do with men following Islam and more to do with them neglecting Islam. And if we truly want to rid injustice in marriage or protect women, we need not reform Islam, but rather, we must return to Islam. 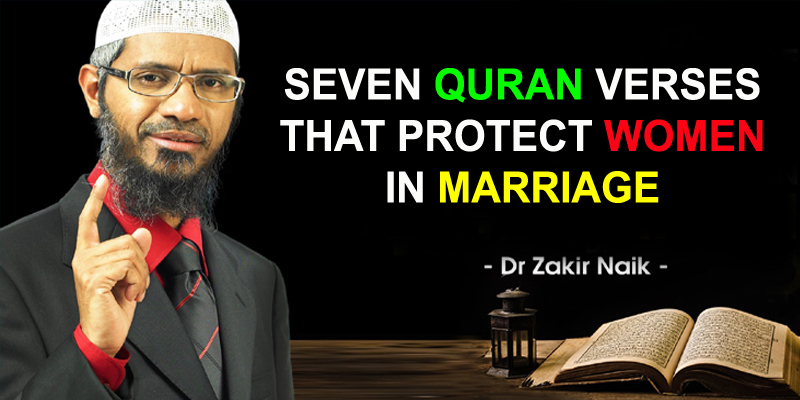 Here Are Seven Clear Quran Verses That Prove My Point And Protect Women. HUSBANDS MUST GIVE WOMEN THEIR DOWRY. Unlike the traditional understanding of a marriage dowry, whereby a woman must give her husband a bridal gift of value upon marriage. Islam reverses the concept whereby it is the husband who must pay his wife whatever sum of money she requests. Not only is a man obliged by law to give his bride-to-be this dowry, but the Quran also states he must do so graciously, without expressing any dissent. These commands from Allah protect Women in Islam. A WOMAN MUST NOT BE RESTRICTED FROM HER WEALTH. Upon receiving her dowry, the husband is also prohibited from touching this wealth entirely. In fact, the Quran mentions that even if she received an immense sum of money; the prohibition still applies; unless she of course willingly offers a portion of it herself. It was common practice in the past that the bride’s father would take her dowry without her consent. This injunction was sent to change this ignorant practice and also remind husbands that their wives are a great trust from God that they shouldn’t take for granted. These verses also protect women in Islam. HUSBANDS MUST ALWAYS TREAT WOMEN WITH KINDNESS. The Quran implores men to treat women with kindness and respect, even in times of dissent or disagreement. This means spouses must practice beauty in their speech, their actions and in their overall presence amongst one another. Even if one may not like something about his or her spouse, God mentions that perhaps this thing may, in fact, bring about much good. These verses protect women and man from their spouses. THE END OF FORCED MARRIAGES. Prior to Islam, following the death of a woman’s husband, the husband’s family would inherit her as a widow. Islam came to annul this ignorant practice and give a woman the right to be her own agent. In fact, Islam came to give women the right to choose their own husbands and the Prophet Muhammad (pbuh) himself directly taught that a woman shall not be married until her permission has been sought. HUSBANDS MUST SPEND ON THEIR WIVES. In an Islamic household, a man is obliged to financially provide for his wife. He is responsible to provide her food, clothing, shelter, medicine and all necessities to the best of his ability. This includes providing his wife with the same standard of living he expects for himself. Such rules apply to the marriage and even after divorce if a woman has a child or is pregnant. A woman is not obliged to spend on her husband, however, if she chooses to do so, it would be recorded for her as an act of voluntary charity. In many instances in the Quran, God would advise Muslims towards patience and avoid divorce. He, in fact, states that if the two spouses truly wanted to resolve their issues, Allah would reconcile the two of them together. Allah will protect women and men in these cases. Nevertheless, if divorce does happen, Allah advises both spouses to do so in a manner that is both righteous and honourable, void of all hardship and conflict. These verses encourage men to further look after their wives to the utmost of their ability and avoid rushing to divorce for every minor issue; an unfortunate epidemic we are witnessing today. Prior to Islam, women would be quite restricted when it came to what wealth they could inherit following the death of their husbands; that is if they were entitled to anything at all. Islam came to set in place certain regulations that would ensure a woman would secure a select sum of money following the death of her husband. The amount a woman receives would, of course, vary according to various circumstances. So we can see that Islam protects Women from negative aspects of marriage. May Allah enlighten us all with the true teachings of Islam and restore peace and happiness to all homes and families. May Allah protect Women in all cases.